Breaking New Ground with Super High CBD Levels! SuperCBDx works their bums off to bring stable, 100% feminized seeds with very high CBD/very low THC levels to the public at large. 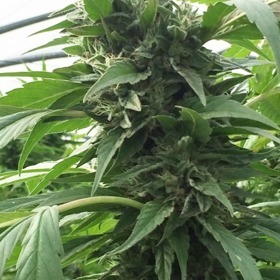 The genetics are top rate & the prices are very affordable. Sugar Helps the Meds Go Down - Try Sweet Tooth X SCBDX! SuperCBDx Serves Humanity with the Finest Medical Marijuana Seeds Available! PJ, the mastermind behind SuperCBDx, knows better than most that there's a great need for cannabis seeds with high CBD levels and practically no THC. He was already a recovering addict when he found out he had cancer, so he wasn't interested in just getting high. PJ researched the value of cannabidiol and was sold on this miraculous cannabinoid, but he couldn't find a single stable strain that he could buy in seed form for his own medicinal use. Once his cancer was in remission, PJ went on a mission to learn everything he could about CBD, and in the process he discovered the secret to breeding non-psychoactive strains with high medicinal value. With this knowledge and great compassion, he wanted to ensure that everyone who needed high-CBD cannabis seeds without a massive high could gain access to a true medical-grade strain at an affordable price. In 2012, he hit on exactly the right combination of genetics, and the rest is history. Now, you can get his SuperCBDx strain mixed with practically any other breed of cannabis you can think of! The list of SuperCBDx hybrids is long and illustrious, but here's a few you have to check out. On name alone, Matanuska Thunderfuck X SCBDX needs a look, but this Alaskan-inspired medical seed is more than hype. With this choice, you'll get a 50% Indica, 50% Sativa genetic profile with icy crystals, high yields and enough CBD to squash anything that ails you. Round this off with a little Jack Herer X SCBDX or Black Kush X SCBDX for & you'll be well stocked for anything that might come up. Take a closer look & you'll find even more SuperCBDx Seeds including Diesels, Widows, Cheeses and Haze! One of SuperCBDx's goals was to make their 100% feminized seeds affordable enough that absolutely anyone could give them a go. We've done our part at Rhino Seeds by pricing them incredibly low, and we'll give you an extra discount if you buy your new medical marijuana seeds with bitcoins plus give you some extra freebies. Crytocurrency is the way to go! Get Your SuperCBDx Feminized Seeds Today - They're the Wave of the Future!